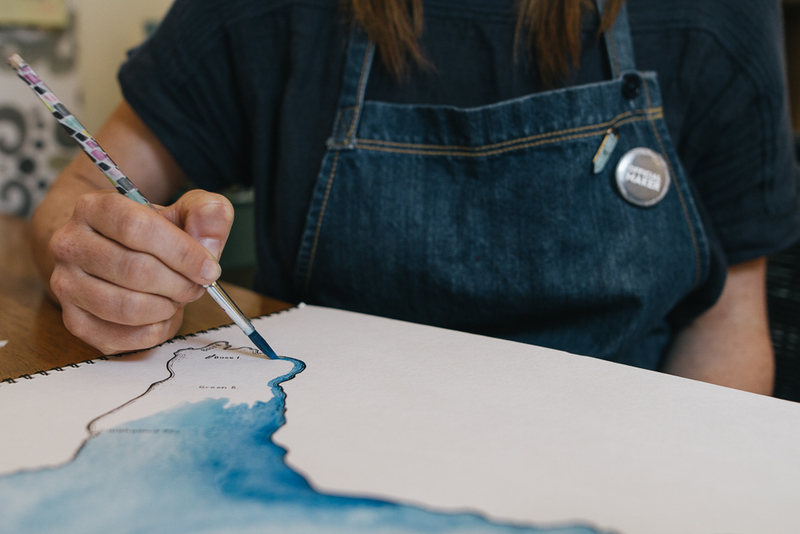 My interest in map making started in my early twenties when I spent nearly ten years living, working, and adventuring around the globe. I used many maps to get places, sometimes to get lost (which was an adventure in itself). One of my favourite ‘map memories’ is laying a map of Ireland on the floor of the train station in Dublin and my friend and I throwing a coin on it; then buying tickets to go to that place. Neither of us could decide on a place to go, so we left it up to fate (the coin chose well, the two years I spent there were magical). Since then I have been sketching big maps and small, noting the details, epic coffee shops, or interesting bits of history. More recently I have begun creating detailed maps of Northern Ontario, places I love, or places that other people love. A map can be so much more that a way to get from one place to another, it can record or even change history, it can evoke feelings or memories, and it can spark deep, meaningful conversations. If you are interested in a custom map of a lake or an area, please sign up for my newsletter. 2019 will find me researching and developing my map making techniques. I will send out a newsletter when commission spots open up - if you are on my newsletter you’ll be the first to hear. 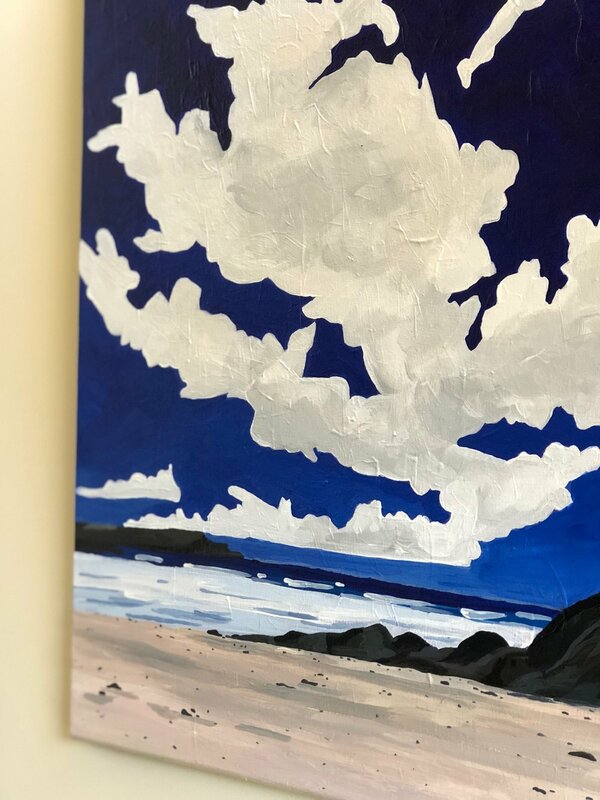 Inspired by the colours and shapes found in the sky, this new landscape series will on display Pinchman's Cafe & Artisan Bakery from September to December 2018. How do you feel after being among the trees? Research shows that spending time in forests and other natural environments supports healing and a sense of well-being. In Japan, it's called 'shinrin yoko', which translates to 'forest bathing'. This collection is inspired by the need to spend time in nature and the change that can be felt in yourself after being 'Among the trees'. During the spring of 2018 I was commissioned by the Art Gallery of Sudbury to create a large scale map of the LaCloche area to accompany the exhibit ‘Through the Camera Lens: LaCloche 1900-1950. The finished map measured approximately 5 x 7 feet and included lakes, towns, geographical features, and noted where the railway once ran from Espanola to Little Current. 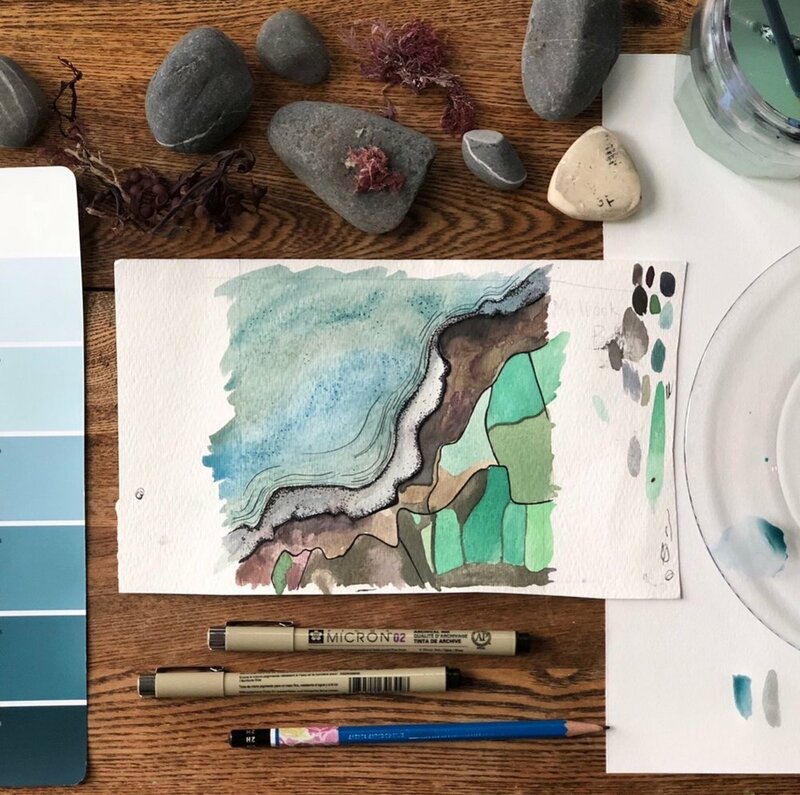 A project where children, their parents, and Grandparents explored the idea of maps as something to connect to rather than to use them to get from point A to B. Participants were encouraged to create a map of a place that was special to them. These maps where then scanned and printed on fabric, then embellished with stitches and buttons. Special thank-you to Art of Where for sponsoring this project. Probably my favourite thing to paint, I am drawn to painting what I know and love. Mainly inspired by Northern Ontario, sometimes I dream of the places I've lived and wake up inspired to bring that image to life. As a former florist, I am constantly drawn back to painting flowers. Flowers and plants are often part of our everyday life yet most of the time, we walk right by them. Sometimes a large scale pop of colour with deep brush strokes is just what a room needs. ‘Stories of the Lake’ is a community based outdoor project that I had the pleasure of facilitating and creating in the summer of 2017 on Manitoulin Island. 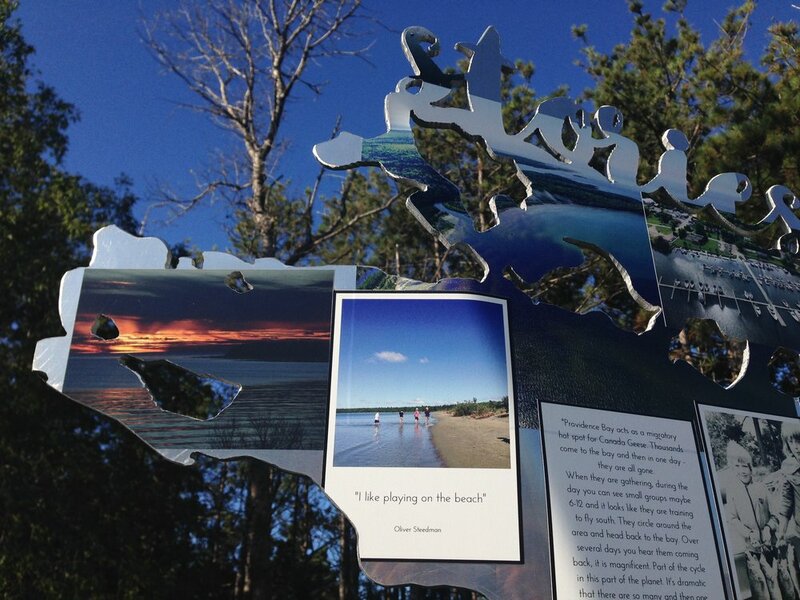 The work focused on what Lake Huron meant to the people who live and spend time on its shores. 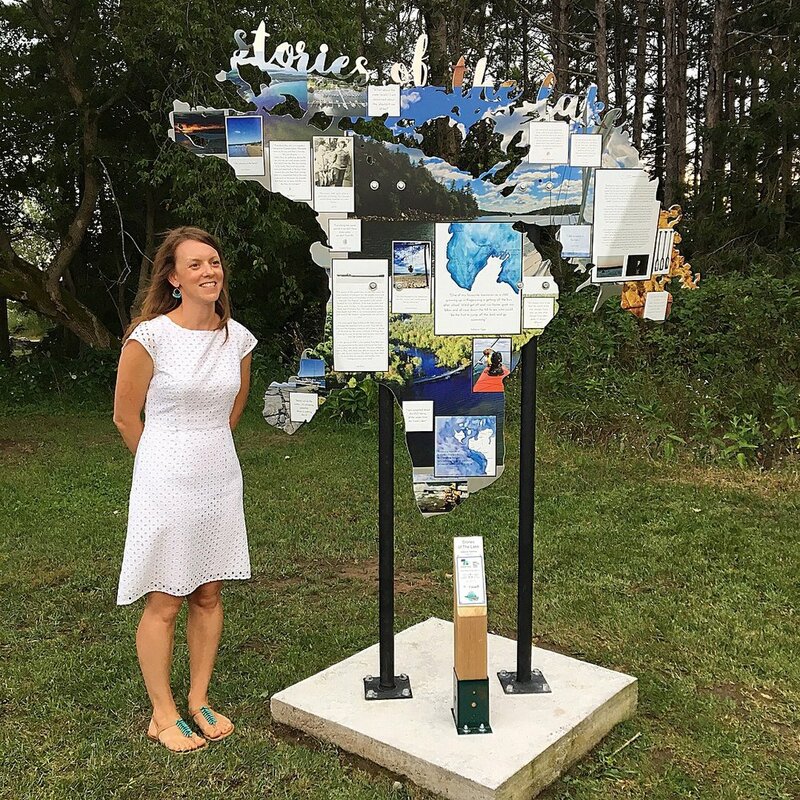 The project was orgazined by Waterlution and was funded by The Ontario Trillium Foundation and Canada 150. As part of the 2017 Up Here Urban Art + Music Festival's Power Up Project I had the opportunity to design and paint a mural. 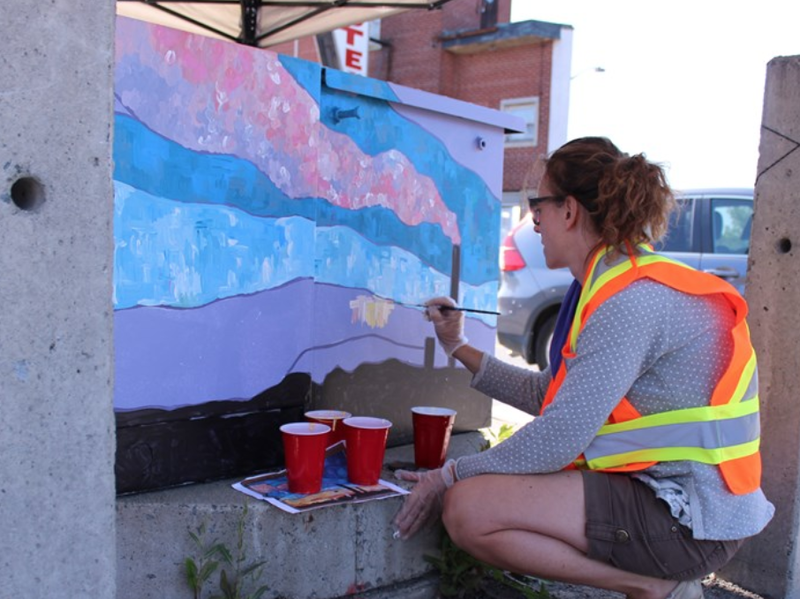 Located of the corner of Minto and Van Horne Street, my mural depicts Sudbury's iconic skyline. Many people think that Sudbury isn't a typical 'beautiful' place, but I think that that really depends on your perspective. This city is full of vibrant, creative, friendly folks and when you look around, it's easy to find beauty. Thank you to the Ontario Arts Council for exhibition assistance with 'my ‘Perception’ show.